While YouTube remains the largest video hosting platform on the web, Facebook — taking advantage of its huge user base — is quickly catching up to become one of the most popular places to view video content. As a WordPress user, you can take advantage of Facebook’s popularity to serve your viewers with content that’s connected to its huge social media network by embedding Facebook video content right into your WordPress posts and pages. While it’s possible to upload video content to WordPress by using the Add Media feature, it is almost always preferable to embed videos from a platform like Facebook. 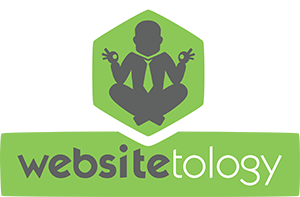 For one, it greatly reduces the amount of bandwidth used by your server, improving your website’s speed. It also gives users the ability to take advantage of social media features of that platform, such as having it appear as a recommended video or engaging in discussion, which is especially great if the video is your own content. The first thing we’ll need to do is get the link address from the video you want to embed on your WordPress site. You can do this easily by browsing to the video on Facebook, then right clicking the date and copying the link, as shown below. 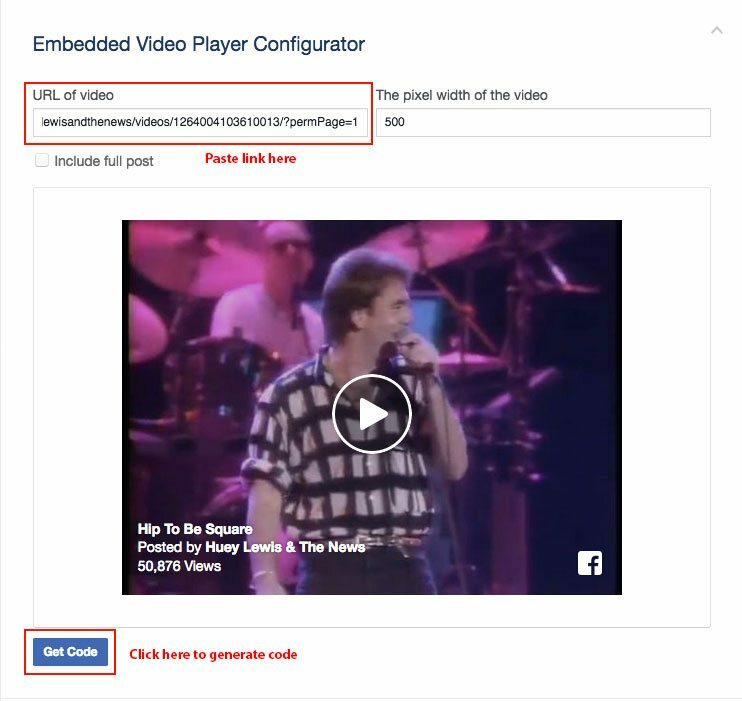 Next, we’ll use the link we copied from the Facebook video to generate a video player code by visiting Facebook’s Embedded Video and Live Video Player page. Scroll down to the section titled Embedded Video Player Configurator, paste the link into field labeled “URL of video,” then click the “Get Code” button at the bottom. There are a few ways to include the SDK in the site’s header. One way is to edit the header.php of your site’s child theme. If you’re not using a child theme, you should be! One of the advantages of doing so is being able to easily include scripts, like in this example, without risk of them being overwritten when your theme needs to be updated. If for some reason you’re not using a child theme, or you don’t want to manually edit the header.php, you can use a plugin, such as the Header and Footer plugin, to do so. Tip: You can center the video by adding the class aligncenter to the div of the video embed, for example: <div class="fb-video aligncenter"
Once that code is there, your video should show up embedded in the post. The nice thing about e-commerce is it’s easy to collect a lot of valuable data. What brought them to your store. What they looked at, for how long, and if they bought. But, when running a small local brick and mortar business, asking all those questions would just tick off a customer. Any Radio Shack shopper remembers always being quizzed for their address so they could send you endless mailings. Loyalty cards were a strategy to gain customer insight- and soon all our wallets were bulging with cards from the grocery store, the gas station, the drug store and the hardware store. Call them rewards cards or frequent buyer cards or VIP, but there was always a quid pro quo, in exchange for the data- the customer would get a discount. The retailer had to pay to get access to data it already had- but, wanted to put a name to it. Generally, this is a strategy pursued by larger companies, smaller ones, couldn’t be bothered with it. Enter a new player. In the race to the bottom to get a scrape of every sale, one of the big boys of credit card processing – FirstData, decided to up their game- rolling in a whole suite of data apps along with their credit card processing and terminal. How big is FirstData? They supposedly process over half of all credit card transactions. Their product is called “Clover” and you can buy it from them direct, or through all kinds of middle men. Most of them make their sale pitch purely about how they are cheaper than the other guy- few have much else in their bag of tricks, despite this group of tools that are also included. If you use Insightics with Clover, you have an incredibly powerful analytic tool that will give you a comprehensive view of customer spending, for cash, check and card transactions. See where your customer density displayed on a map. This will allow you to see where marketing efforts have been working and where there is potential for future promotions. Identify products that are trending one way or another. This will help you see changes in product trends in your local environment and also help in making pricing/specials decision making. See how your competitors are doing. Are you riding the same waves as other similar businesses in your area or are you ahead or behind them? Know how weather affects traffic into your business. This will allow you to make staffing decisions based on forecasts. Know what sells best based on the weather. Yeah, it’s true. Consumer buying decisions change with the weather. Add notes as data points as often as you like. When you make a staffing change, menu or inventory change, marketing or promotion, really any changes you make to your business can be added to Insightics to help you find out if it was a good move or if it really had a positive return on your investment. Typical of a mega business trying to speak to small businesses- FirstData/Clover/Insightics can’t put together a super clear presentation or even decide what the name of the product is (It may now be called Clover Insights). There is an API– which should make it easy to hook into the data for integration in your CRM/Marketing automation system. Being able to see where your customers live, track sales data vs your competition (remember, they are called FirstData for a reason) and overlay that vs weather, days of the week, and to give you insight a cash register wouldn’t all built into the credit card processing solution. They’ve also integrated their platform with a whole bunch of apps- some free, some with monthly fees- to add loyalty/rewards cards, or gift cards etc. See the list here: Clover App Market. Of course, the flipside to all this is that your competitors are also seeing your data- although anonymized. And since the Clover system is a POS- even cash sales numbers are being gathered. If you are interested in finding out more on how to save money on credit card processing- and add the benefits of big data, or to find out how to make more use out of your data, just drop us a note and we’ll be glad to steer you in the right direction. 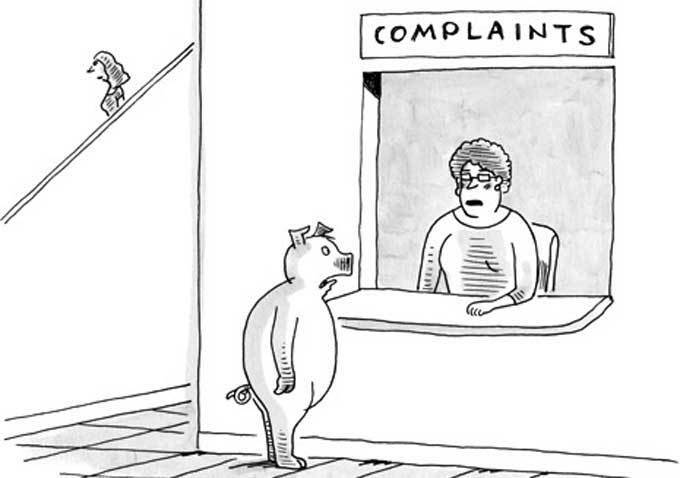 Every so often, we get a call from a client (most of the time a restaurant) asking “can’t we do anything about bad reviews on ( insert site name here)” and the answer is sure, but, you have to worry about it all the time, not just when it suits you. An ounce of prevention is worth ten tons of headaches after they leave and trash your place. The sad thing is, it doesn’t even have to be true- and people will believe it. A client, a local pizza shop had someone say “the chicken wasn’t cooked- still raw” which is impossible, since all his chicken is pre-cooked. Another restaurant got a bad review by a guy who wrote in a reasonable tip on his charge, then came back in demanding a refund for his $5 beer with a $1.34 tip which he claimed was a $1 more than it should have been, and wanted $10 back in cash. The part he left out- he also called the cops to try to settle his dispute. And these are “reviewers”? Yelp doesn’t just review restaurants, so you might want to check what people have said about your business there. Other sites you may be getting reviewed on: Facebook, Trip Advisor, Foursquare, Zomato (formerly UrbanSpoon) and Google. Google has a mechanism to ask for reviews to be reviewed- but it’s a little tricky to find your way there, so here’s a video guide. Again, the best way to avoid bad reviews- excellent customer service. And, if people seem really happy, ask them to write an amazing review for you.